Some of Facebook’s features debut with fanfare, while others are quietly introduced. One intriguing function flying under the radar: the social network’s browse feature. You can access it in the News Feed sidebar, and it sends users to randomly generated Graph Searches. Pressing on the Browse button will send you to a pre-selected Graph Search based on your friends, networks, location, or interests. 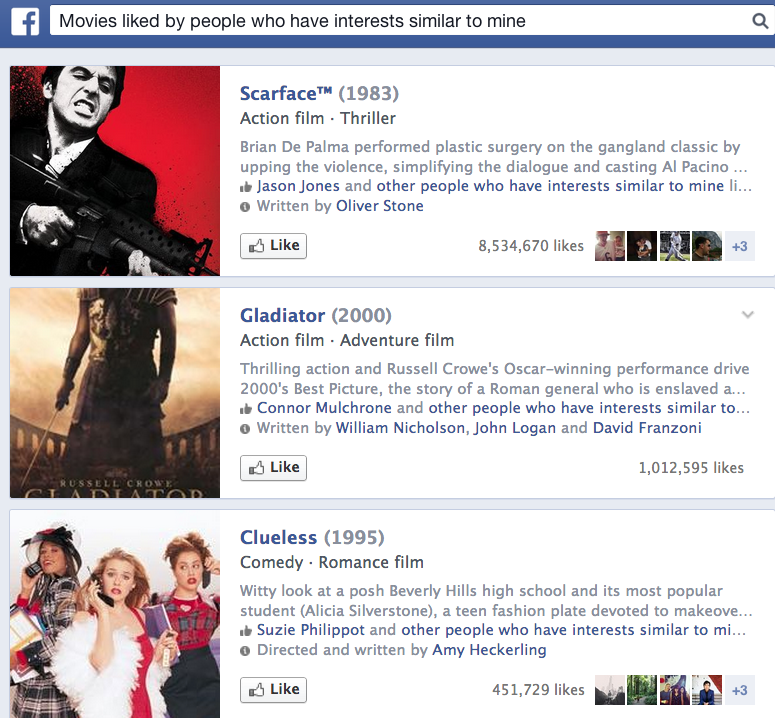 The first time, I got “Movies liked by people who have similar interests to mine.” It confirmed my affinity for Clueless but also taught me something surprising: Apparently, my interests are aligned with Scarface. I didn’t know I had the tastes of an upper-middle-class undergrad bro, but OK.
For my second Browse experience, the category Facebook selected was “People who will graduate from St. Ignatius College Prepatory School in 2005 and are not my friend.” This weird, grammatically incorrect category was basically a list of people from my high school who have de-friended me, so thanks for that confidence killer, experimental Browse feature, I hate you. Hoping to come up with something less esteem-destroying, I tried a few more browses. I got “Cover photos liked by my friends,” (which taught me that my friends enjoy scenic cover photos), “Favorite Books of Toronto, Ontario Residents,” which taught me that people in Ontario really like Eckhart Tolle, and … “People Who Are Not My Friends Who Went to St. Ignatius College Prepatory School” yet another catalog of people I’ve loved, lost, and gotten de-friended by in what MUST be a misunderstanding. Based on my experiences with the Browse feature, it is both a way to make you feel sad about being disliked by your former high school classmates … and a pretty obvious attempt on Facebook’s behalf to get people to use Graph Search. OK, it’s mostly just a way to get people to use Graph Search. Anyone else see the “Browse” option in their sidebar and gotten fewer soul crushing results?